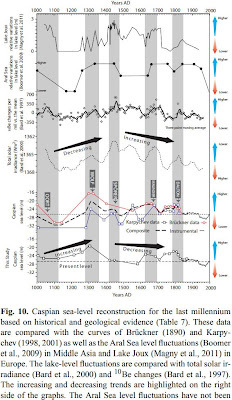 A new paper published in Climate of the Past reconstructs sea levels in the Caspian Sea [the world's largest landlocked sea] over the past millenium and finds sea levels were controlled by solar activity. According to the authors, "A comparison of the Caspain Sea Level curve with other lake systems and proxy records suggests that the main sea-level oscillations are essentially paced by solar irradiance." The authors find decreased solar activity leads to higher Caspian sea levels and vice-versa, and show a long-term increase in total solar irradiance over the past 500 years. The present sea level is found to be not high or low in comparison to the past millenium. The findings raise several points of interest in the current climate debate, namely that tiny variations in solar activity can have large, amplified effects upon the hydrological cycle and climate, and that there is no evidence of an influence of CO2 levels on the hydrological cycle. Caspian Sea Levels shown in bottom graph, Total solar irradiance is shown in 3rd graph from bottom on an inverse scale. Abstract. Historical literature may constitute a valuable source of information to reconstruct sea-level changes. Here, historical documents and geological records have been combined to reconstruct Caspian sea-level (CSL) changes during the last millennium. In addition to a comprehensive literature review, new data from two short sediment cores were obtained from the south-eastern Caspian coast to identify coastal change driven by water-level changes and to compare the results with other geological and historical findings. The overall results indicate a high-stand during the Little Ice Age, up to −21 m (and extra rises due to manmade river avulsion), with a −28 m low-stand during the Medieval Climate Anomaly, while presently the CSL stands at −26.5 m. A comparison of the CSL curve with other lake systems and proxy records suggests that the main sea-level oscillations are essentially paced by solar irradiance. Although the major controller of the long-term CSL changes is driven by climatological factors, the seismicity of the basin creates local changes in base level. These local base-level changes should be considered in any CSL reconstruction.